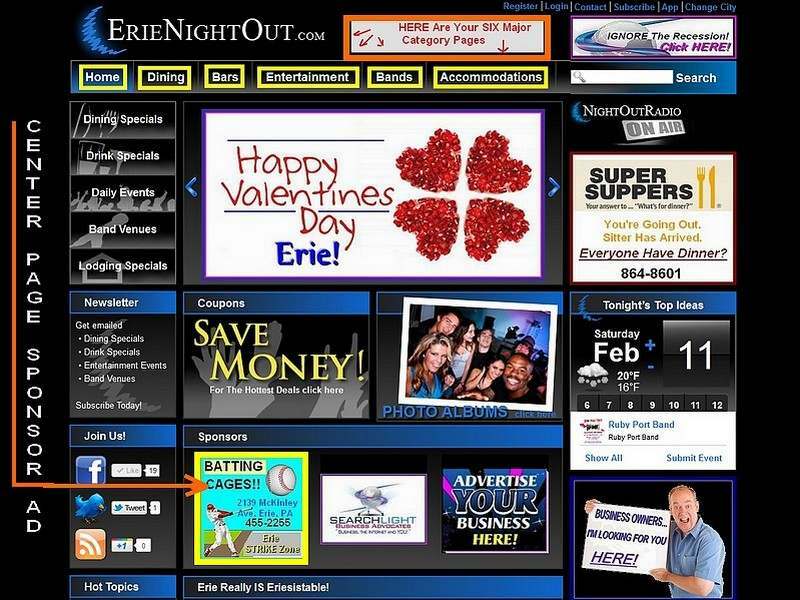 Place Your ErieNightOut.com Ads HERE! In case you aren't aware of the relationship, ErieNightOut.com is a sister company of Erie's SEARCHLIGHT Business Advocates (this website). Please READ ALL of the information on this page and send us any special requests/details BEFORE submitting your ads. This will help ensure that everything goes smoothly and we get all of your details CORRECT! 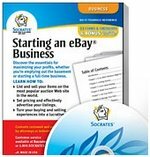 WHY is it a great business decision to advertise on ErieNightOut.com? Traditional print and broadcast media are losing effectiveness due to the INTERNET. That's a true and permanent fact. NIGHTTIME Activities and Entertainment Focused! Not cluttered with everything under the sun! Extremely TARGETED. 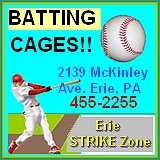 - Site Users are M and F ages 21 to 65 that have the money to be ACTIVE in Erie's fabulous NIGHTLIFE and culture. SO THEY ARE YOUR BEST PROSPECTS TOO. Highly INTERACTIVE - Link to your own website or Facebook page, Send text messages in REAL-TIME, etc. More! ALL ABOUT FUN! - Our heavy promotions throughout the GREATER Erie Area and the FUN nature of ENO are creating rapid growth and popularity for us (and for you)! Extremely AFFORDABLE - You simply CAN'T find a better advertising value anywhere. For these common sense business reasons and many more, this is your ultimate Erie advertising resource. Please NOTE that the rates below reflect the 2014 NEW YEAR KICKOFF! SPECIAL rates! They are already 50% off the current regular rates AND when you place mutiple ads on 2 or more main category pages, it gets even BETTER! We're accepting only the first (10) TEN advertisers. These rates will LOCK IN for all of 2014 for you unless you cancel so DON'T hesitate! DEADLINE is NOON on Wednesday JAN. 29th at 4pm. Ads requested/placed after 5pm on that day will NOT be eligible for this very special one-time offer. Click HERE to view a screenshot illustrating your AD options. and/or HERE to view the site again LIVE. SAMPLE 2x2 AD ( shown actual size - 160x160px ) The Ad will LINK directly to your Facebook or Website too! Select the number of ads from the DROPDOWN box just below. Enter your desired Phone and Link info. Click The SUBSCRIBE Button and Enter Your Info. on the next appearing page. -- That's it! ORDER BELOW Via PAYPAL ( Use either your Paypal Account Balance OR a CREDIT CARD. NOTE: You do not need a Paypal Account to order by Credit Card. Just FIND the LINK on the Paypal page for CREDIT CARD and then enter your info. 100% guaranteed secure. (Ex. Paper check), simply make that request to us using the contact info. below. ***Only IF necessary, please use THIS FORM to tell us WHICH specific PAGE(s) on which you want your ad(s) published. Please be SPECIFIC and THOROUGH in your descriptions. Since any type of advertising is more of an "art" than an exact science we ask that you generally commit to a minimum 6 month campaign with us. However - by subscribing to ErieNightOut.com advertising you are under NO contract obligation whatsoever. This is actually a month-to-month service for your convenience. Opting out could not be simpler. and be billed only for the current billing cycle. To initiate a cancellation simply notify us using the contact info. below and we will immediately send you an UNsubscribe link so that you may easily stop your campaign.